Anthony Sannazzaro, Kimshelley Lessard, Lindsay Plake, David E. Frank. Photo by Paul Rubenstein. 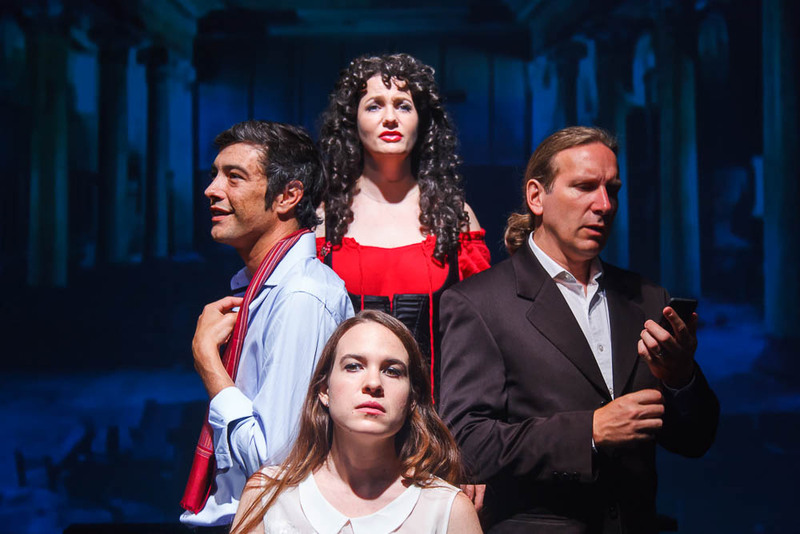 In a very challenging play, Carmen Disruption is a meditation on the dispossession of contemporary human life. Most especially is the disconnection between humans in a society. It’s a very intriguing thought to ponder the fact a city society is comprised of a multitude of strangers to one another. How close and yet how far apart each one is from resembling anything like a community or village folk. The play does a masterful job in surgically dissecting the individual subjective psyches of each character, with riffs of monologues that are deep as they are shallow. And that is the perplexing thing. Have human beings always been this shallow? Is the run of the mill life a completely unexamined life, whose only instance of initiating an inventory audit of what they are and who they are emerge from environmental trauma like in the play? Make no mistake the brutal admissions of the characters are biting and penetrating, yet they lack a certain profoundness that is the mark of leaving the theatre enlightened rather than bewildered. This could be a criticism of the objective of the script. But the objective of the script was not to leave the audience uplifted and spiritual. It is, in the nicest manner possible, meant to hold a vanity mirror before the audience whose heads are so commonly slunk forward over a soft-blue digital screen, thinking themselves integrated warmly with other humans by being plugged in, and yet are so oblivious to being coldly unplugged from reality. It is quite the symbolic directorial gesture to posture every character in isolation as if they were each an island within a larger archipelago. That is the general theatrical statement with the play: contemporary technology with its pretentious ability to unify only does so in a superficial manner. The real drama of humanity lie within the chasms in the sea of invisible bits streaming over our heads. Above all else, the emotions conveyed digitally are necessarily superficial because of their artifice. But more, their bandwidth is exceptionally limited. It does not provide the salvation of catharsis when one’s life is disrupted or becomes unpleasant. And it is this emptiness and vacuum for emotional relaxation discovered as a technological blind spot by the play. Disregard the subjective truths of the characters genuflecting being licked harshly by the tongue of European decadence. The fact they have no one to share their soreness with is startling. They are indeed islands with no knowledge of the winds of each other. People are just brief splashes of experience who turn into memories, further penciling them as shades of a fuller livelihood in the shadow of high tech mass communication devices. Carmen Disruption plays a very somber duet with the film Her in capturing the quintessential tragedy of becoming reliant on an artificial social life and favoring a digital society over maintaining a connection with a genuine one.